Q&A: Humatics CEO David Mindell talks with Robotics Business Review about how millimeter-based precision will help self-driving cars, industrial robotics, and smart city development. Knowing where you are at any given moment is a somewhat easy task for humans, but can be extremely difficult for robots, self-driving cars, or subway trains, which need centimeter- or millimeter-precise coordinates for navigation or avoiding other objects. One company working on improving robotics to know their exact location is Humatics, a three-year-old company based in Cambridge, Mass. The company is implementing microlocation technology through radio frequency sensors and analytics software. Humatics says it can measure the positions of objects in a three-dimensional space with millimeter-scale precision at up to 30 meters. 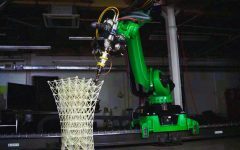 The company raised $18 million in Series A funding in September 2017, and earlier this year it acquired 5D Robotics and its subsidiary, Time Domain, to further its technology development. Robotics Business Review spoke with the company’s co-founder and CEO, David Mindell, about the potential for microlocation to disrupt several industries, including industrial automation, self-driving vehicles and smart city development. Q: Tell us about Humatics and the company’s vision. Mindell: We sometimes think of ourselves as a robotics company that’s never going to make a robot. We’re building a navigational system that connects people, robots, and infrastructure. These are microlocation technologies that you can think of as the successor to GPS, where instead of a single giant coordinate frame that covers the Earth, we’re building many very small, linked, very high precise coordinate frames that work in the built environment – indoors, in cities, underground – which enable centimeter and even millimeter precision for navigational interactions between people, places, and things. Q: How did the microlocation technology develop? Mindell: The technology stemmed out of work I did over a 20-year period with microlocation in the deep ocean. I came out of the Woods Hole Oceanographic Institution before I came to MIT in the 1990s. [At Woods Hole] I was working with Bob Ballard’s group and we were doing precision surveys soon after they had found the Titanic, shipwrecks, and hydrothermal vents in the deep ocean. It became clear that microlocation was absolutely key for enabling robots to work with people, even in those extreme environments, to open a whole new world for robots providing data and mapping and precision applications. So for years I wanted to do something similar on land instead of with sonar, which is what we did in the ocean. About four years ago I met Greg Charvat, who is now our CTO and was our first employee, he’s a great young guru of small and short-range radar. He and I built a proof-of-concept system, and since then we’ve engineered it to a real industrial-grade precision microlocation system. We’ve acquired some other technologies, so we have systems that will navigate over as far as 500 meters with precision as low as a millimeter. Q: Was there any sort of “Aha!” moment when you were developing this technology, or were there other market forces that told you to create the company at this time? Mindell: One of them was that the presence of automotive radar – radar has typically been a very expensive high-end application that the military and a few others could use. The appearance of automotive radar over the last 10 years or so has really driven the cost down considerably to the point where a small company like ours can really innovate with very cheap components. We think of ourselves as the only company that’s innovating simultaneously in both radar and robotics and bringing those two things together. Obviously there’s a lot more robots out there, and the demand is just going off the charts for knowing where the robots are. Once you know where they are, that just greatly expands the flexibility of robotics to any number of applications. There’s no question that the time is right – the automotive autonomous vehicle space is realizing that it’s just not going to work for the car to be alone in the city – it has to be in communication with the environment around it to make the economics work, to make the safety work – these are all just larger forces that told me three years ago it was time to start this company. Q: With centimeter- and millimeter-precise location, does this mean you can do everything, or are you looking to get even more precise? Mindell: It’s interesting – our customers go from, “Why would I need that much precision?” to “Gee, can you get me something that’s 10 times more precise?” The nature of the technology is on a Moore’s Law kind of curve, where we’re always going to be getting more precise – there is demand for more precise than millimeter in certain industrial applications. At the same time, part of the nature of the system is that it’s designed to be scalable, so customers can pay for the precision they need at any given moment, and there are some applications where you don’t need that kind of precision in those ranges. Q: What are the current limitations of GPS in terms of accuracy? Mindell: GPS is an amazing system, but one of the big killers is multipath reflection in urban canyons – it doesn’t work well in cities. It doesn’t work well indoors, and even less so underground. That’s what we call the “built environment” – it’s where most people live and work. We’re navigating in those environments. You should always use GPS for the best you can do in any given moment. There’s no reason not to use GPS. We make it better, we make it more reliable, we fill in the many different kinds of shadows. If you think about the Uber driver connection problem – when your driver think she’s sitting in front of your house, but she’s actually 30 meters away down the block – in a busy city, that can be 10 to 15 cars away. That’s a case where the lack of precision in GPS really impacts performance and time efficiency and a lot of value at that scale. Q: What are the big applications that you’re going after? Mindell: In industrial automation, precision equals performance – knowing where things are in an industrial setting relative to each other, whether it’s manufacturing equipment, or robotics relative to the products that they’re adding value to. Moving vehicles and other types of mobile platforms with very high precision around industrial environments – these are all things where more precision equals more performance, and the ROI is extremely clear. In the longer term, although we’re actively working in the autonomous mobility space, where you provide a really great complement to lots of other sensors – I often say we don’t make any of the other sensors obsolete – we make them all better. Q: In the robotics market, what problems do robots have in terms of precision and location? Mindell: Navigation is one of the core underlying [features] of all robotics – certainly mobile robotics. Right now there are very limited applications for robotic arms or manipulators on mobile platforms, because when they approach a work cell or a station, they don’t have the precision to actually do anything without a complex calibration process. We take that entire calibration process out and make it a real-time positioning process. So there are many places where knowing the precise position of your end effector, of your robotic system, is hugely valuable and enables you do things you just weren’t able to do before. In some cases it replaces machine vision systems that can be very slow, very short range in order to get high precision – our system works over much longer distances and is a thousand times faster in some cases than a machine vision system at getting millimeter-accurate readings. Q: What future robot applications do you envision that could do more things because of this accuracy? Mindell: I think the sort of truly robotically enabled flexible factory depends on unified, high-precision coordinate frames among different mobile elements. People are still really very separate from robotic systems – we envision microlocation enabling much deeper levels of human-robot collaboration, where the robots really know where the people are with a very high degree of precision, and vice versa. Anything that entails people, robots, and infrastructure relating to each other is just hugely enabled by microlocation. Q: Are you seeing interest from makers of large industrial robots, or is this more for the smaller, collaborative robots that are already doing some work with humans, aka cobots? Mindell: We have a lot of interest and are doing pilots with some of the largest industrial robotic manufacturers in the world. We use collaborative robots in our own company, but so far the use cases tend to be more on the larger scale, that’s where the economics are located in the robotics industry. Q: On the mobile robotics side, we assume microlocation would help the robot in terms of route planning and navigation. Are there any other benefits? Mindell: Again, precision equals performance. You don’t need heavy mechanical fixtures to bring mobile platforms up against fixed infrastructure. Indoor/outdoor is a big application for us, because we don’t rely on optical sensors – we’re immune to sunlight, darkness, and dust and paint. Q: How can cities looking to develop smart city infrastructures take advantage of microlocation technologies? Mindell: We’re actually already in the smart city business – our technology is being incorporated into the new signaling system in the subways in New York City. Sometimes people ask “what problem are you trying to solve?” and we say, go look at a platform in midtown Manhattan at rush hour in the subway, we’re solving that problem. Our stuff really works well underground, it’s been used for many years in mining applications, in rail applications above-ground in hostile environments. The subway environment is really well suited for the system – it provides a whole level of precision localization that expands the capacity of these very expensive capital systems without having to buy new tracks. Q: How will self-driving cars work with microlocation and smart cities? Mindell: The autonomous car space really is a robotics space – I think the world has come around in the last six months to realize that smart cities and driverless cars are going to evolve together – there’s no other way it can happen. It doesn’t make sense to try to pack all the expensive intelligence onto the car when you can distribute it at scale throughout a city as a shared, common infrastructure – it’s a very exciting time for how the intelligence in the car is being rethought through the world of smart cities. Q: As a startup with such impact with many large industry applications, how do you fight the urge to try and not sell this to everyone? How do you keep your team focused on its goals? Mindell: We spend a lot of time just thinking about that. If you want to know what a city is going to look like in 10 years, you look at the more advanced factories today. So we’re proving the technology out in a lot of the industrial settings. They’re a little bit more structured, they’re a little bit more fast moving compared to the cities, but there are very real connections there. There are many interesting applications of the technology that we pared off our focus list that we hope we will get to someday, but right now we’re seeing such wonderful traction in industrial automation and in the mobility space, that we’re just totally concentrating there and making sure that everything we do applies in those worlds. Q: What are your thoughts on the convergence of robotics and artificial intelligence? Mindell: We consider ourselves to be part of that – we have a saying at Humatics, “X, Y, Z is the AI.” Just knowing where you are is an enormous application, it requires an enormous application of intelligence, and producing those estimates with the kind of precision and other parameters that robots need to make decisions is really what Humatics is all about. Once you have those X, Y, Zs, you can do all kinds of amazing things with robots that are very hard to do otherwise. Q: How big can the microlocation market get? Mindell: We think it’s such a big important idea, that there’s room for a lot of players here. It’s an amazing problem that it hasn’t been solved yet in the sense of the most fundamental question: “Where am I? Where am I going? How do I relate to the things around me?” You can go back through history, and every time there’s been a major navigational innovation, it’s changed the way that people could work with technology and opened up enormous new markets and applications. We see ourselves in that space. Nobody imagined 30 years ago that every phone would have a GPS in it, but look what it’s done for us. On the one hand we do a lot of very exotic stuff in RF hardware and software, and on the other hand we measure the most fundamental quality that everybody can understand – how far away am I from Point X, and how do I turn a few of those measurements into a position? Everybody understands what that is, and everybody understands why it’s important.